I was looking forward to reading this award-winning book, especially after viewing the moving documentary Waste Land which, though set on a different continent, also tells the story of people who make their living scavenging through mountains of other people's trash. 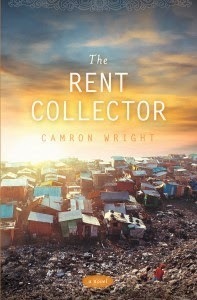 But while I appreciate the author's intent with The Rent Collector, I didn't find it effective. The Rent Collector centers on Sang Ly, a young mother, and her family who live at Stung Meanchey, the largest municipal waste dump in Cambodia. Her husband Ki Lim works long hours every day in dangerous conditions to scrounge enough scrap metal and other items to sell to feed his family. Their son, Nisay, is very ill and every treatment they've tried has failed to restore him to health. The titular character is Sopeap Sin, a perpetually drunk, angry old woman who appears every month to gather the rent payments and is impervious to sob stories of medical expenses or stolen money. By accident or serendipity, Sang Ly discovers that Sopeap Sin can read and begs Sopeap to teach her. At first resistant, Sopeap agrees and Sang Ly learns not only the mechanics of reading but how to draw meaning from literature, as well as Sopeap Sin's tragic history. The message of hope and redemption and persistence and finding beauty everywhere is a wonderful theme, but the execution is lacking. Simply put, the book felt rushed and not fully fleshed out. Relationships weren't developed so much as spontaneously bursting into existence. Set-ups were truncated and their pay-offs were trite or contrived; events seemed to happen because it was time for something to happen rather than because they were a natural progression of the story. There was more "telling" than "showing" about the characters and how they interacted with each other and that led to an emotional distance between the reader - or at least this reader - and the characters. The tone and diction also seemed out of place, perhaps exacerbated by the choice to write in the first person as Sang Ly; an uneducated woman from Cambodia is unlikely to use phrases like "obvious issues with trust" or "Model Parent Award". Conversations often felt inauthentic, like something I'd hear on an American television show instead of in a Cambodian waste dump. Sopeap Sin's epilogue describes the important and horrific historical background of the Khmer Rouge that should have informed the entire book rather than being almost an afterthought to explain a single character's actions. However, the stories and particularly the poems included were touching. And you'll get no argument from me that, as Sopeap Sin teaches Sang Ly, literature is "a handbook for the art of being human" and "good stories teach!"